For the most accurate sizing, have someone else take your measurements making sure the measuring tape is snug but not tight against your body. Measure over light clothing. Use our sizing charts as a guide to determining your size. Sizing information is provided by the manufacturer and does not guarantee a perfect fit. 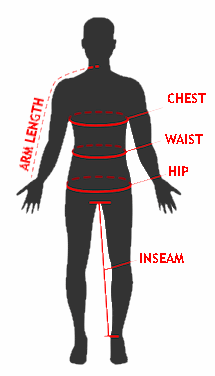 Measure around the fullest part of your chest,under your armpits, keeping the measuring tape horizontal. Be sure that your arms are resting at your sides. Measure from center back at the base of your neck, along the shoulder and down the arm ending at your wrist with a slightly bent elbow. Measure around the narrowest part (typically the small of your back where your body bends side to side), keeping the measuring tape horizontal. Measure from the base of the crotch, along the inside of your leg and down to your ankle. An easier way is to take a pair of pants that fit you well and measure the inner leg inseam.